Increase in incidence and prevalence of cancer across the globe is projected to drive the global radiation therapy market during the forecast period, as radiation therapy is used in nearly 50% of all cancer treatments. Rise in the number of cancer patients across the world is anticipated to propel demand for therapeutics. According to the American Institute of Cancer Research, around 18 million cancer cases were diagnosed globally in 2018 and head & neck cancer accounted for about 4% of all cancers in the U.S. in 2017. Moreover, an estimated 65,000 individuals will develop head & neck cancer in the near future. Increase in demand for highly efficient radiation therapy systems for cancer treatment and new product approvals are projected to augment the global radiation therapy market during the forecast period. The global market has witnessed an increase in new product approvals in the past few years. This is anticipated to propel the global market from 2018 to 2026. For instance, in February 2019, ViewRay, Inc. received 510(k) clearance from the U.S. FDA to market new soft tissue visualization capabilities for the MRIdian system. The system is expected to help clinicians in the assessment and prediction of radiation therapy. Radiation therapy in general has high costs linked to it due to the use of sophisticated equipment and machinery. The total cost of treatment depends upon the number of sessions, type of radiation, and patient’s health coverage. According to estimates, the cost for a radiation therapy course for treating breast cancer is approximately US$ 8,000, and around US$ 18,000 for prostate cancer. In terms of revenue, the radiation therapy market in Asia Pacific is projected to expand at a high CAGR during the forecast period. 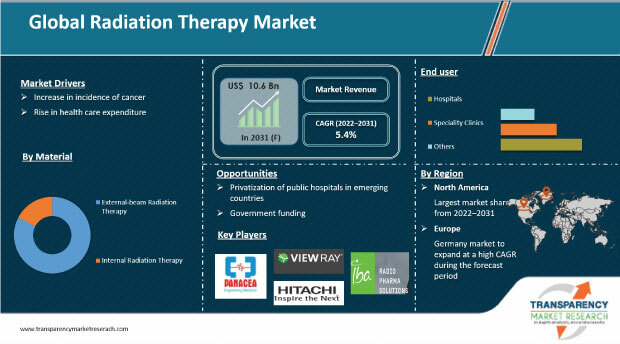 Rapidly increasing patient population in the region and rise in product launches are anticipated to boost demand for radiation therapy systems, which in turn is expected to drive the market from 2018 to 2026. Increase in government expenditure in the health care segment is likely to fuel the growth of the radiation therapy market in Asia Pacific during the forecast period. According to the Union Budget of India for 2017–2018, the total health care expenditure was increased from 1.97% to 2.27% of the total budget. The report also provides profiles of leading players operating in the global radiation therapy market. These include Varian Medical Systems, Elekta AB, IBA Radiopharma Solutions, Accuray Incorporated, Isoray, Inc., Mevion Medical Systems, Hitachi, Ltd., ViewRay, Inc., and Panacea Medical Technologies Pvt. Ltd. Increase in mergers & acquisitions, strategic collaborations, and new product launches are expected to drive the global market during the forecast period. For instance, in November 2017, Varian Medical Systems opened a new facility in Jundiai, Brazil, to increase access to advanced radiotherapy treatment in the country and across Latin America.